Here is an alphabetical list of the Picatinny Rail Hole Spacings for a range of popular rifles. Taken from the Recknagel Catalogue. The rails Recknagel produce are pre drilled to fit, therefore the hole spacing is exact to the model. This makes it a straight forward job of screwing it straight onto the rifle action. 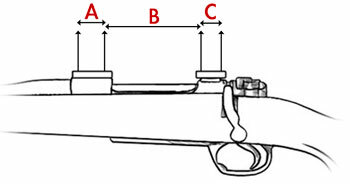 The list of rifles includes the BH, which is the height of the rail from the action. Indicated is the 20 MOA option next to a certain number of rifle models. Plus the Recknagel part number, in case you are interested in ordering the part for your rifle. All measurements are taken in mm. Posted by: Alan Rhone - Wed, Mar 5, 2014 at 11:44 AM This article has been viewed 32123 times.